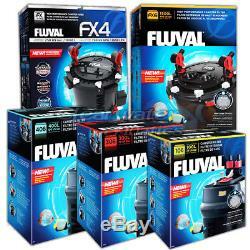 FLUVAL EXTERNAL POWER FILTER'S Please select from the above menu for size required: Options Include. Fluval 106-406 Canister Filters delivers many practical benefits including better filtration, less maintenance frequency, faster setup, and quieter operation all designed to make fish keeping more enjoyable. Building on the success of Fluval 05 Series filters, this filter provides enhanced functionality and filtration performance that creates the cleanest, healthiest aquariums ever. Key features include: - Improved motor hydraulic performance that reduces maintenance frequency, increases flow rates and head pressure - Enhanced water filtration performance for cleaner, healthier water - Better biological filtration, with the addition of Bio-Foam media - Sound-dampening impeller design for 8 to 15% quieter operation - Redesigned impeller cover thats less prone to breakage - Re-engineered efficient priming system for easier starting - Stronger lift-lock clamps for more secure closure - Hose lock nuts improves security The filter helps make aquarium keeping as easy and worry-free as possible by providing a remarkable range of additional features, including patented Aqua-Stop Valves for easy hose disconnections, single-motion lift-lock clamps for simple cleaning and maintenance, and multiple removable filtration baskets that are already packed with the necessary media for mechanical, chemical, and biological filtration. In addition, the filter has a unique square-shaped canister design that holds 35-50% more water than round canister filters of similar size, allowing better water flow through a complex cleansing path that maximizes contact with the filtration media. 4 Foam pads - 1 x 70 g carbon - 1 x Polishing pad - 1 x 120 g BIOMAX - AquaStop valve assembly - Ribbed hosing - 2 rim connectors - Intake tube - Intake strainer - Output nozzle - 2 rubber connectors - Instruction manual - Quick start manual. 4 Foam pads - 1 x 70 g carbon - 1 x Polishing pad - 1 x 120 g BIOMAX - 1 x Bio-Foam - AquaStop valve assembly - Ribbed hosing - 2 rim connectors - Intake tube - Intake strainer - Output nozzle - 2 rubber connectors - Instruction manual - Quick start manual. 4 Foam pads - 2 x 70 g carbon - 2 x Polishing pads - 2 x 120 g BIOMAX - 2 x Bio-Foam - AquaStop valve assembly - Ribbed hosing - 2 rim connectors - Intake tube - Intake strainer - Output nozzle - 2 rubber connectors - Instruction manual - Quick start manual. 4 x Foam pads - 4 x 70 g carbon - 2 x Polishing pads - 2 x 120 g BIOMAX - 2 x Bio-Foam - AquaStop valve assembly - Ribbed hosing - 2 rim connectors - Intake tube - Intake strainer - Output nozzle - 2 rubber connectors - Instruction manual - Quick start manual. Building on the mighty FX performance and reliability platform, the all-new FX4 high performance canister filter is a compact'little brother' to the FX6. The FX4 bridges the gap between the Fluval 406 and the FX6 canister filter, making it an ideal choice for aquariums up to 250 US Gal (1000 L). Multi-stage filter pumps out 700 gallons (2650 L) of water per hour. Advanced microchip technology continuously monitors and optimizes pump performance. Self-starting - just add water, plug in and Smart Pump. Trapped air auto-evacuated every 12 hours to ensure maximum efficiency. Easy water changes eliminate need to carry heavy buckets. Simply attach hosing to output and Smart PumpTM does the rest. Removable, stackable media baskets eliminate water bypass and hold a total of 1 gallon (3.9 L) of media. All filter media included - mechanical, chemical and biological. Valves positioned at convenient 45-degree angle for easy installation and rotation. Anti-clog, telescopic strainer ensures continuous water flow. Multi-Directional Output nozzles can be fully adjusted to create customized water flows. Utility Valve with drain hose for easy maintenance and flushing of canister. Rubberized feet help ensure quiet operation. Compact 16.5 tall design - easily fits under most aquariums. For use in freshwater and saltwater aquariums. Designed for aquariums up to 400 gallons (1818 L), FX6 is the high-capacity workhorse of Fluval's canister lineup, enhanced with all the power and reliability you've come to expect from a high-performance filter. Multi-stage filter pumps out an astounding 925 gallons (3500 L) of water per hour. Improved motor technology provides better performance while consuming 10% less electricity than previous generation. Removable, stackable media baskets eliminate water bypass and hold a total of 1.5 gallons (5.9 L) of media. Purge Valve with drain hose for easy maintenance and flushing of canister. 21 tall design - easily fits under most aquariums. The item "FLUVAL 106 206 306 406 FX4 FX6 EXTERNAL CANNISTER FILTER INC. MEDIA FISH TANK" is in sale since Friday, December 1, 2017. This item is in the category "Pet Supplies\Fish & Aquarium\Filters". The seller is "clearwater_aquatics" and is located in Leicester, Leicestershire. This item can be shipped to United Kingdom, Austria, Belgium, Bulgaria, Croatia, Cyprus, Czech republic, Denmark, Estonia, Finland, France, Germany, Greece, Hungary, Ireland, Italy, Latvia, Lithuania, Luxembourg, Malta, Netherlands, Poland, Romania, Slovakia, Slovenia, Spain, Sweden, Australia, United States, Canada, Brazil, Japan, New Zealand, China, Israel, Hong Kong, Norway, Indonesia, Malaysia, Mexico, Singapore, South Korea, Switzerland, Taiwan, Thailand, Chile.